All net transactions charged to the RONA card are eligible for cash back in gift card. Visit our store and talk to one of our consultants so he may help you complete your project and recommend the best payment options according to your needs. *Value is for information purposes only. The annual cash back value may vary at the time of purchase based on the applicable taxes. Consolidate the transactions for your project into one financing plan. Take advantage of 2 months at 0% interest to accumulate all purchases and returns related to your project. At the end of this period, the total will be payable in equal monthly instalments. Applicable on transactions of $1,500 and more. Choose between 48 and 60 instalments. When you apply online, by mail or by fax, you can start making purchases only when you receive your RONA credit card and get your 10% cash back on your first transaction. When you apply in-store, you can make purchases the same day you apply. If you have questions, please call Desjardins cards Customer Services at 1-800-363-3380. The RONA card is accepted at all participating RONA, L’Entrepôt RONA, Home & Garden RONA, RÉNO-DÉPÔT stores and all other participating banners. ~AIR MILES ® cash is offered at participating RONA stores and other AIR MILES Sponsors. Redeem AIR MILES reward miles in the Cash balance of your AIR MILES Collector Account in increments of 95 reward miles for $10 off your purchases to a maximum of $200 per day. All Rewards offered are subject to the Terms and Conditions of the AIR MILES Reward Program, are subject to change and may be withdrawn without notice. For complete details, visit airmiles.ca. ®™Trademarks of AIR MILES International Trading B.V. Used under license by LoyaltyOne, Co. and RONA Inc.
To enjoy the benefits of the RONAdvantages program (hereinafter called the “Program”), you must be a resident of Canada and have a RONA private label consumer card (hereinafter called the “RONA card”). All RONA card applications subject to Fédération des caisses Desjardins du Québec ("the Fédération") approval. Certain conditions apply. Cardholders must refer to the variable credit agreement (VCA) for all other terms of credit. 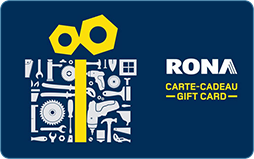 The RONA card is accepted at participating RONA, L’Entrepôt RONA, Home & Garden by RONA and Réno-Dépôt, as well as at other participating RONA Inc. (hereinafter called “RONA”) banners. The complete list of participating retailers is available at ronavdantages.ca. The Program is open exclusively to individual consumers; corporations and other organizations are not eligible. With the exception of the AIR MILES ® program, a RONA card cardholder may not combine Program offers with any other existing program, including but not limited to: an available volume discount* or rebate program*, or a commercial agreement*, whether or not linked to a charge account at a particular store. * Including commercial and individual discount price lists offered by a merchant. RONA card cardholders receive 1 AIR MILES reward mile for every $20 in purchases charged to their RONA card, according to their billing cycle. The number of AIR MILES reward miles awarded is rounded down to the next whole number; fractions of reward miles are not awarded. AIR MILES reward miles are awarded on all transactions made with the RONA card (sales minus returns) at participating stores. Interest charges and other fees are excluded from the calculation of AIR MILES reward miles. AIR MILES reward miles are transferred to the collector’s AIR MILES account up to thirty (30) days following the issuance of the collector’s RONA account statement. To receive AIR MILES reward miles, the cardholder must provide his/her AIR MILES collector number in the appropriate space on the RONA credit card application form. 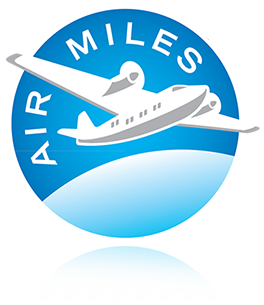 RONA card cardholders who do not have an AIR MILES Collector Card must request one online at www.airmiles.ca. RONA card cardholders must then provide Desjardins Card Services with their AIR MILES collector number by calling 1-800-363-3380. AIR MILES reward miles begin accumulating from the date on which Desjardins Card Services receives the RONA cardholder’s AIR MILES collector number. The retroactive issuance of AIR MILES reward miles is not authorized nor granted. This offer may be modified or cancelled without notice. 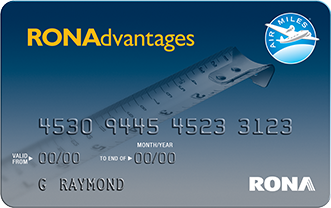 To receive up to 2x the AIR MILES reward miles, RONA card cardholders must pay for their transactions using the RONA card and present their AIR MILES Collector Card at the same time. The standard base AIR MILES offer at RONA, L’Entrepôt RONA and Home & Garden by RONA is: 1 AIR MILES reward mile for every $20 purchases before taxes and excluding the purchase of gift cards. Bonus mile offers apply only upon presentation of the AIR MILES Collector Card and do not apply to the RONA card, with the exception of AIR MILES promotional offers linked to use of the RONA card which may be in effect from time to time. If AIR MILES bonus miles are issued through a promotion linked to the use of the RONA card, they will be issued only in respect of the offer’s conditions. RONA reserves the right to change, suspend or cancel the benefits described herein, in part or in whole, at any time, with or without notice to the cardholder. RONA card cardholders can obtain from RONA up to 5% cash back annually in the form of RONA gift cards. The amount of the annual cash back in the form of RONA gift cards is determined as a percentage ranging between 2% and 5% according to the rebate scale shown below. All transactions charged to the regular limit, as well as those charged to the Desjardins Accord D financing limit for the RONA card, are included in cash back calculation. Transactions charged through the RONA card at Marcil and Ace banners, taxes, interest charges and other fees are excluded from the calculation. To be eligible for the rebate, the value of the annual purchase transactions posted to the RONA card, less the value of the annual return transactions posted to the card, must exceed $2,000, in which case an annual cash back rebate percentage will be determined as per the rebate scheme below. The annual limit for cash back in the form of RONA gift cards is $1,000. The cash back in the form of RONA gift cards is calculated on the anniversary of the RONA card’s issuance date and is rounded up to the nearest whole number. RONA gift cards are sent by registered mail no later than sixty (60) days after the RONA card’s anniversary date. For a cardholder to be entitled to this benefit, his or her RONA card account must be open and in good standing at the moment the gift cards, if any, are issued. Cardholders are responsible for verifying every account statement they receive. They must advise La Fédération des caisses Desjardins (hereinafter called the “Fédération”) of any error or omission on their account statement. RONA reserves the right to ask the cardholder to provide copies of invoices for transactions posted to his or her RONA account in order to calculate the annual cash back in the form of RONA gift cards. RONA shall not be held accountable, and will not accept liability, in case of any error on the part of the Fédération. RONA gift cards issued as part of the Program have no expiry date. The RONA gift cards are deemed to be active from the moment they are sent by registered mail or delivered directly to the RONA cardholder in any other manner. The RONA cardholder must accept the RONA gift card’s terms and conditions as stated on the back of each card. RONA reserves the right to change, suspend or cancel the benefits described herein, in part or in whole, at any time with or without notice to the cardholder. At all times, to benefit from one of the payment options described below, the cardholder must request it from the merchant at the time of the transaction. Eligibility to these payment options is, at all times, subject to Fédération des caisses Desjardins du Québec ("the Fédération") approval. Interest rates are subject to change. The financing options offered by RONA cannot be used for the purchase of RONA gift cards. The financing program does not apply to online purchases. A participating retailer may, at its sole discretion, ask the cardholder to pay the taxes at the time of the transaction, in which case they will be charged to the regular limit of the RONA card cardholder. The "Multiple purchases through equal payments" offer or "Multi-purchase Plan" allows the customer to make multiple purchases over a period of two months ("the deferral period") for a specific project, without making any payment nor incurring interest during this period. At the end of the deferral period, the balance of the multiple purchases is payable in 24 or 36 equal and consecutive monthly instalments, accordingly to the plan registered during the deferral period, at an annual interest of 13.5% if the balance is less than $2,500 or, if the balance is equal to or greater than $2,500, at an annual interest rate of 4.0% (for transactions posted to the account with the 24 instalments plan during the deferral period) or at 6% (for transactions posted to the account with the 36 instalments plan during the deferral period). Equal monthly instalments are included in the minimum payment due on the card. Minimum purchase: $1,500. The "Equal Monthly Payments with interest" offer allows the customer to pay for purchases through equal and consecutive monthly instalments. The annual interest rate of 8.9% set at the time of purchase applies to such purchases. Equal and consecutive monthly payments are included in the minimum payment due on the credit card. Other promotional, interest-free financing plans may be offered now and then and will apply for a limited time and with certain conditions. For example, pay interest-free equal monthly payments. See below conditions applicable on these financing offers. Cannot be combined with any other promotional offer, nor with the RONA credit card sign-up offer. The "Interest-free equal monthly payments" offer allows the customer to pay for purchases through equal and consecutive monthly instalments with no interest. Equal monthly payments are included in the minimum payment due on the credit card. If the minimum payment due is not paid in full by the due date, the annual interest rate of not more than 19.9% on the card applies to the unpaid equal monthly instalments. If the minimum payment due is not paid in full by the due date, the annual interest rate of not more than 19.9% on the card applies to the unpaid equal monthly instalment, including monthly instalment. There is a 21-day, interest-free grace period on the card from the date the monthly statement is mailed or from the date it is made available in electronic format to settle the account without paying interests. Minimum card payment is 5% of the total on: (i) the balance shown on the account statement for the previous period; (ii) interests on purchases and monthly instalments that have not been paid on the due date for the previous period; (iii) regular purchases during the statement period; (iv) monthly instalment(s) relative to Multiple purchases through equal payment or Multi-Purchase Plan for the statement period; (v) deferred payment purchases due on the statement date; and (vi) past due amounts and any other amount set out in the card contract. Other conditions can be applied, refer to the card contract. RONA reserves the right to change, suspend or cancel the flexible payment options described herein, in part or in whole, at any time with or without notice to the cardholder. Two distinct credit limits: one for regular purchases and one Desjardins Accord D limit that entitles the cardholder to obtain financing at participating stores for the purchase of goods and services. Exclusive offers with each monthly statement. Annual interest rate of 19.9% on the RONA card. Interest rates are subject to change. RONA card account balances can be paid at most financial institutions and participating stores. The Fédération shall not be held accountable in the event that a merchant refuses to accept the RONA card. The Fédération is not responsible for managing the program. The RONA card is the property of the Fédération des caisses Desjardins, which reserves the right to withdraw or have withdrawn and terminate, in part or in whole, one or more of the services it offers, without notice to the cardholder. In none of the above cases shall the Fédération’s liability be called into question. RONA shall not be held liable for any decision on the part of the Fédération in this respect. Eligibility subject to Fédération des caisses Desjardins du Québec approval. Offer available only on a new RONA credit card in-store application. The discount is valid on the first in-store purchase, made with any financing plan offer, the day of the application. The discount offer is valid on any merchandise purchase of $299 and more before taxes, on the same invoice. The offer is valid on a transaction of $299 or more including taxes, charged to the RONA credit card. Offer valid upon presentation of the coupon mailed with your new RONA credit card. The coupon will be valid for 60 days following the account opening date. ®™ Trademarks of AIR MILES International Trading B.V. Used under license by LoyaltyOne, Co. and RONA.